The RME HDSP MULTIFACE II analog/digital-interface. A powerful external break-out box for the HDSP System that delivers multi channel professional audio on your Mac or Windows computer. The RME HDSP MULTIFACE II is not only multi because of the many different interface formats supported, but also multi-channel. The small box using half the space of a 19 inch rack includes outstanding power and extensive features. 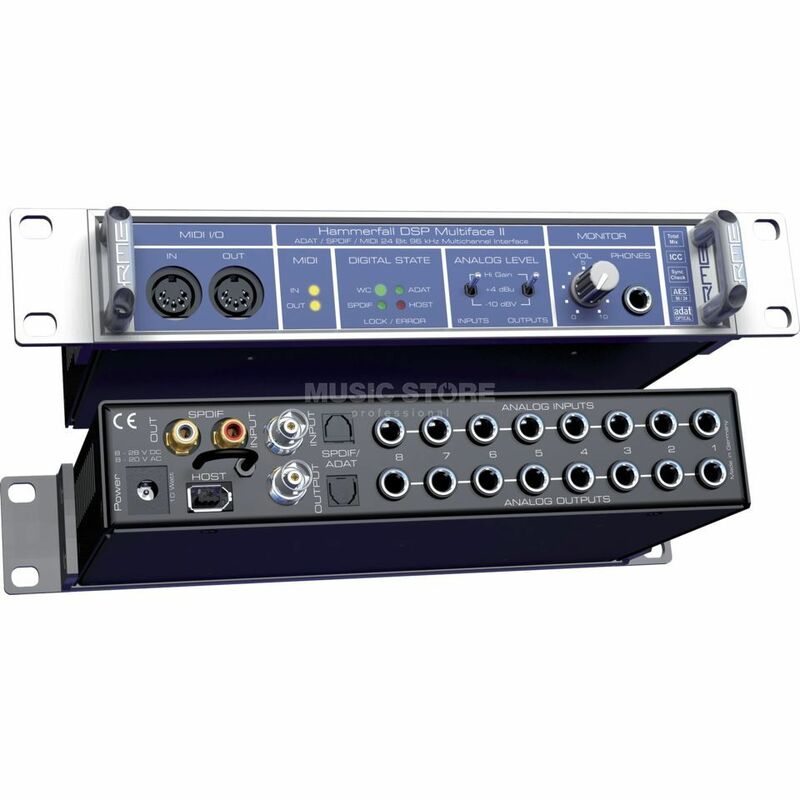 Based on RME's award-winning Hammerfall technology and equipped with the latest circuit designs of the Fireface 800, the RME HDSP MULTIFACE II offers ADAT optical I/O, SPDIF I/O, MIDI I/O, word clock I/O and a separate hi-power monitor output. The RME HDSP MULTIFACE II also provides 8 analog inputs and outputs, balanced and 96 kHz/24 bit, of course. All this can be used on laptops as well as on desktop computers with 'zero cpu load' and low latency. The front panel of the Multiface II hosts some useful status LEDs, like MIDI state, lock state of the digital inputs and error state of the host-bus. Additionally there's a high-quality 24 bit/96 kHz analog line output, also usable with headphones, and one MIDI I/O. Multiface II has a rear panel with unrivalled connectivity: 8 analog line I/Os on 1/4 inch TRS jacks (balanced, 24 bit/96 kHz), ADAT optical I/O (switchable to SPDIF optical), SPDIF I/O coaxial and word clock I/O. The RME Multiface 2 can be used with laptops as well as desktop computers. The connection to notebooks is achieved via a CardBus card, the connection to desktops via a PCI card. These interfaces are sold separately.